The Oconee County Board of Commissioners tonight made significant changes to the list of projects the county will send forward for potential inclusion in the 2012 Transportation Special Purpose Local Option Sales Tax referendum. The Board eliminated the Daniells Bridge Road Extension and flyover of SR Loop 10 entirely after protest from citizens in the area, scratched the widening of US 441 in the south of the county, and added three new projects to the list of capital projects. Added to the capital project list were an entrance to Gainesville State College from the U.S. 441 Bypass of Watkinsville on an extension of Bishop Farms Parkway, which now is the only access to the college. Also added were the upgrade of two interchanges on SR 316, one at Jimmy Daniell Road and the other at McNutt Creek Road. The upgraded SR 316 interchanges would be grade separated, meaning they would include a bridge. Already on the list was a grade separated upgrade of the SR 316 interchange at the Oconee Connector. The top three projects on the list remain the three phases of the widening of Mars Hill Road from SR 316 to Watkinsville. The Oconee Connector interchange is ranked fourth, followed by the widening of Jimmy Daniell Road, the entrance to Gainesville State College and the Jimmy Daniell and McNutt Creek Road interchanges. The list now goes to the Northeast Georgia Regional Commission and the Georgia Department of Transportation for review. Commissioners Chuck Horton and Margaret Hale took the lead in eliminating the Daniells Bridge Road Extension, saying they were responding to feedback from people in the neighborhood who opposed the project. Three persons, including me, spoke at the meeting tonight about that project and asked that it be eliminated or expanded to include significant additional improvements to the existing Daniells Bridge Road. The proposed extension would have been four lanes wide and would have deposited traffic on a two-lane Daniells Bridge Road. The county has said it cannot widen Daniells Bridge Road from Chestnut Hill Road to the Oconee Connector to four lane in the existing right of way. Commissioner John Daniell said that while he agreed to pull the project from the list, that did not mean that the flyover would not be built at some point in the future. It is part of the county’s commitment to expand the commercial hub at the SR Loop 10 and SR 316 interchange, he said. Commissioner Jim Luke was the advocate for addition of the SR 316 interchanges. He said he felt everyone in the county agreed that the roadway needs to be upgraded for safety reasons. BOC Chairman Melvin Davis had added the Gainesville College interchange to the list via an email message he sent to the other commissioners on March 23. The original list had been created by Davis, county Administrative Officer Alan Theriault, Strategic and Long-Range Planning Director Wayne Provost, and Public Works Director Emil Beshara and had been presented to the BOC on March 1. Davis and the three other administrators also had created a list of nine additional project, labeled as Safety Improvement Projects, for that same meeting. Tonight Beshara and Provost gave the Board a revised list with three additional projects, the widening and reconstruction of Daniells Bridge Road from Chestnut Hill Road to Hog Mountain Road, the widening of Union Church Road, and upgrades to 10 rail crossings in the county. That list was approved by the BOC without alteration. The three projects of the city of Watkinsville, an extension of Simonton Bridge Road to route traffic around downtown, sidewalks for Simonton Bridge Road and sidewalks for Harden Hill Road, also were forwarded to NEGRC and GDOT. Two last minute additions to the list from Bogart also were passed forward. They are for improvements to the Burson Avenue and Atlanta Highway interchange and widening of Osceola Avenue. After the review by the regional commission and GDOT, the Oconee list will go to a regional roundtable, which will merge the requests with those of the 11 other counties in the regional transportation district. It also will pare down the lists to reflect projected revenue from the tax. The other counties are Barrow, Clarke, Jackson, Walton, Greene, Jasper, Morgan, Newton, Elbert, Madison and Oglethrope. In August of 2012, voters in those 12 counties will be asked to approve an increase in sales tax of one penny on the dollar to fund the list of transportation projects agreed upon by the roundtable. The tax, if approved by the majority of voters in the district, will run for 10 years. The Oconee County Board of Commissioners is scheduled to review at its agenda-setting meeting Tuesday night possible transportation projects to be included in a new sales tax referendum to go before voters in August of 2012. Included on the list are seven major construction projects and nine smaller projects selected by Board Chairman Melvin Davis and three county administrators and three projects submitted by Watkinsville. As of the end of the day on Friday, the deadline for the cities to submit their lists, Bishop, Bogart and North High Shoals had not submitted any projects, according to Alan Theriault, county administrative officer. The BOC Tuesday night could modify the list, decide not to send forward any projects or even decide that Oconee County doesn’t want to participate in the T-SPLOST initiative. Opting out of the tax, which would add 1 cent to the existing 7-cents-on-a-dollar sales tax already in place, is rather unlikely. Wayne Provost, director of strategic and long-range planning for the county, told the Commissioners on March 1 that the county will get double the money from the state for its road projects compared to today if the tax is approved. He also said the county will be penalized by reduced state funding for local roads if it doesn’t seek the tax or if voters don’t approve it. Oconee County cannot act alone. The decision on participation in the referendum must be made in collaboration with the 11 other counties that form the special tax district for the referendum. If the county is successful in getting some of the projects from the list it submits on the approved project list for the referendum, those would be funded by the sales tax, which, according to state estimates, will generate $1.5 billion in tax revenue each year. Oconee County is lumped with Barrow, Clarke, Elbert, Greene, Jackson, Jasper, Madison, Morgan, Newton, Oglethorpe and Walton counties for purposes of the tax project. All of those counties must agree on the final list to submit to voters, and a majority of voters in the 12-county district must approve in the August 2012 referendum for the tax to go into effect. The Oconee County list, with or without submissions from the four cities in the county, must be submitted to the Northeast Georgia Regional Commission by March 30. The list will be reviewed by the Regional Commission and then by the Georgia Department of Transportation. The Executive Committee of what is called the Northeast Georgia Regional Roundtable will view the lists submitted by the 12 counties, match them with the expected revenue from the tax, and create the final list to be submitted back to the Roundtable and then to the voters. The projects on the list approved by the Roundtable will be the ones to be funded by 75 percent of the tax revenue. The remaining 25 percent will be returned to the counties and cities for transportation projects, based on a formula reflecting road miles. BOC Chairman Melvin Davis and Watkinsville Mayor Walter are on the regional Roundtable. Davis is one of five members of that group elected to the Executive Committee at a meeting held on Dec. 7 of last year. The other four are Hunter Bicknell from Jackson County, Kevin Little from Walton County, Kathy Morgan from Newton County and Billy Pittard from Oglethorpe County. All five are commission chairs. At the Dec. 7 meeting, Bicknell was elected chair of the Executive Committee. The Georgia House Transportation Committee has named two additional members of the executive committee (Rep. Tom McCall, Elbert County, and Rep. Len Walker, Walton County), and the Senate Transportation Committee has named one (Sen. Frank Ginn, Madison County). These three members are nonvoting. The meeting on Tuesday night will be the second opportunity for Oconee County citizens to voice their opinions about the proposed list. The meeting is scheduled to begin at 7 p.m. in the courthouse in Watkinsville. Citizens were given a chance to speak at the March 8 meeting of the Land Use and Transportation Planning Committee after that Committee reviewed the list. It did not take any formal action on the proposed projects. After the Northeast Roundtable Executive Committee creates its short list, but before the Roundtable takes a final vote, citizens will have two additional chances to comment on the list, according to the minutes of the Dec. 7 meeting. The details of the scheduling of those citizen meetings are not final. The list of major projects created by Chairman Davis and the county administrators consists of the widening of Mars Hill Road and Experiment Station Road from SR 316 to Watkinsville (three phases), construction of a grade-separated interchange for SR 316 and the Oconee Connector, the widening of Jimmy Daniel Road from Mars Hill Road to the Clarke County line, the construction of an extension of Daniells Bridge Road with a flyover of SR 10 Loop, and the widening and reconstruction of US 441 to four lanes from the Watkinsville bypass to the Madison bypass. The smaller projects, called safety improvement projects, are for Astondale Road, Barnett Shoals Road, Bob Godfrey Road, Clotfelter Road, Colham Ferry Road, Hodges Mill Road, Salem Road, Simonton Bridge Road, and Mars Hill/RockyBranch/Virgil Langford roads. Mayor Walter told me, and Theriault confirmed, that Watkinsville is asking that three projects be added to the list. The top Watkinsville project, Walter said, is a Simonton Bridge Connector, which would skirt downtown Watkinsville from the intersection of Experiment Station Road and Main Street to Simonton Bridge Road. The second project is for a sidewalk on Harden Hill Road from New High Shoals Road to Main Street, and the third is a sidewalk on Simonton Bridge Road from Main Street to the city limits. These latter two would fall under the Bicycle and Pedestrian Program Area, Walter said. At the Oconee County Land Use Committee meeting on March 8, citizens were presented only with the County list, and several voiced concern about the design of the Mars Hill Road widening and about the Daniells Bridge Road flyover. The project description for the Daniells Bridge Road Extension calls for construction of an new road from just north of the Chestnut Hill Road intersection with Daniells Bridge Road to Jennings Mill Parkway, at Home Depot, across SR 10 Loop. The new roadway would be four lanes wide, but it would intersect with and put traffic on the existing Daniells Bridge Road, which is only two lanes wide at that point. 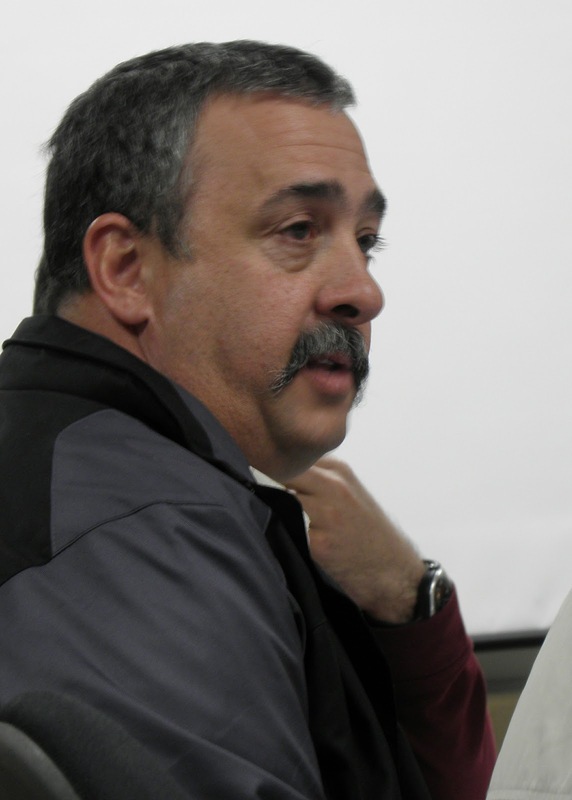 County Director of Public Works Emil Beshara and Provost told the citizens at the March 8 meeting that the county would need to make improvements to Daniells Bridge Road should the project be funded, though those improvements are not included in the project description. The Daniells Bridge Road Extension is listed as a $10 million project. Beshara said at the March 8 meeting he estimates the additional work needed to upgrade Daniells Bridge Road would cost another $20 million. According to the project description Provost provided to the Land Use and Transportation Planning Committee, the Daniells Bridge Road Extension would relieve traffic from the SR 316 Loop 10 interchange and the SR 316 and Oconee Connector intersection “by providing an alternate route” to and from Watkinsville. That route would be Daniells Bridge Road. Beshara said at the March 8 meeting that traffic might be allowed to enter and leave SR Loop 10 at the flyover, adding additional traffic to Daniells Bridge Extension and to Daniells Bridge Road itself. Daniells Bridge Road is three lanes wide from its intersection with the Oconee Connector to Founders Grove Boulevard, but it is only two lanes wide from that point to where it ends at Hog Mountain Road. The county envisions the Daniells Bridge Road Extension as part of a commercial loop roadway around the SR 316 and Loop 10 interchange. The northern part of that loop is currently under construction and is designed to open up additional land behind Lowe’s and Wal-Mart for commercial development. That part of the project is expected to be completed by the end of this year. In December of 2008, when the BOC rezoned property in the blind curve on Daniells Bridge Road just west of the proposed terminus of the Daniells Bridge Road Extension, Beshara told the Commission that the county did not have sufficient right of way to make Daniells Bridge Road four lanes wide through the blind curve. He said that the better strategy would be to build a new roadway south of the existing road. That would require acquisition of property and cost $20 million, he acknowledged at the March 8 meeting. The county has never released a map of such a road. The only one it has released (above) shows an upgraded Daniells Bridge Road following its existing path. Four major subdivisions depend on Daniells Bridge Road for access: Founders Grove (and Settlers Ridge), with about 120 lots, Welbrook Farms (115 lots), Birchmore Hills (80 lots) and Lake Wellbrook (115 lots). All are largely built out. Additional, smaller subdivisions are on Chestnut Hill Road and along Daniells Bridge Road. I live in Welbrook Farms and was one of those who spoke at the March 8 meeting suggesting that the county either drop the Daniells Bridge Road Extension from its list or expand the project to fully upgrade Daniells Bridge Road. Procedures for creation of the list of T-SPLOST projects are specified in House Bill 277, called the Transportation Investment Action, passed by the General Assembly last year and signed into law by then-Gov. Sonny Perdue in June. Rep. Bob Smith and Sen. Bill Cowsert, representing Oconee County, voted for the bill. The tax will apply to food and beverages, but it will not apply to fuel for motor vehicles or for off-road farm equipment. It also will not be placed on sale of jet fuel and the sale of energy for manufacturing. If approved, the tax would start in 2013 and run for 10 years. The sales tax was selected over an increase in the gas tax in part because people are driving more fuel efficient cars, carpooling and using mass transit, making the gas tax inadequate revenue source, according to the state web site created to explain the tax. As of March 1, 2011, according to the Georgia Secretary of State records, 310,744 active voters were registered in the 12 counties that make up the Northeast Georgia T-SPLOST tax district. Of those, only 6.8 percent are in Oconee County. Clarke Count has 18.7 percent of the voters, followed by Newton with 17.9 percent, Walton with 15.5 percent and Barrow with 11.1 percent. In total, 63.2 percent of the active registered voters are from those four counties. While Oconee County voters will have relatively limited impact on the vote outcome, they will pay the tax when they shop at home or in other counties in the district, if voters in the district approve it. If it gets some projects from the county onto the list presented to voters, more of those tax dollars will come back to the county than if it does not. That is why the list the BOC will review on Tuesday night is so important. Twenty citizens showed up at the Oconee County Land Use and Transportation Planning Committee meeting tonight, voicing concerns about the widening of Mars Hill Road, the lack of county planning for transportation options for people who cannot drive, a proposed extension of Daniells Bridge Road to fly over SR 10 Loop, and other transportation matters. The occasion was a public discussion by the Land Use Committee of county priorities for funding by a Transportation Special Purpose Local Option Sales Tax, which is expected to be on the ballot in August of 2012. One citizen said, regardless of what the county proposes, that he plans to vote against the sales tax, which would add a penny for every dollar spent to the existing seven-cents-per-dollar sales tax already in place in the county. He also said he would work to get others to vote against the tax as well. The 14-member Committee used the first half of the two-hour meeting to learn what the county is doing to prepare for the tax and what projects a committee of county officials thinks should be on the county’s priority list. Those officials have identified seven major construction projects and nine smaller projects, called safety improvement projects, as the county’s priorities. The Committee was not asked to take any action on the list, and it didn’t take any. Board of Commissioners Chairman Melvin Davis, who joined the Committee for the discussion, did indicate that the BOC will take up the list at its March 29 agenda setting meeting. The BOC reviewed the list at its March 1 meeting, but it also took no action. The final county list is supposed to be turned over to the state for review on March 30. Before that time, the four county officials who made the list reviewed tonight will consider another list or lists from the four cities in the county and incorporate the projects of the cities into a final list for presentation to the BOC. The four officials are Davis, Wayne Provost, director of strategic and long-range planning for Oconee County, County Administrative Officer Alan Theriault, and Public Works Director Emil Beshara. Provost and Beshara led the discussion at the Committee meeting tonight. The list of major projects consists of the widening of Mars Hill Road and Experiment Station Road from SR 316 to Watkinsville (three phases), construction of a grade-separated interchange for SR 316 and the Oconee Connector, the widening of Jimmy Daniel Road from Mars Hill Road to the Clarke County line, the construction of an extension of Daniells Bridge Road with a flyover of SR 10 Loop, and the widening and reconstruction of US 441 to four lanes from the Watkinsville bypass to the Madison bypass. The safety improvement projects are for Astondale Road, Barnett Shoals Road, Bob Godfrey Road, Clotfelter Road, Colham Ferry Road, Hodges Mill Road, Salem Road, Simonton Bridge Road, and Mars Hill/RockyBranch/Virgil Langford roads. Bob Isaac, a member of the Committee, raised questions about the Daniells Bridge Road extension and its impact on the residential area along that roadway before citizens were given a chance to speak, and several of those citizens spoke of similar issues. The project description calls for construction of an extension of Daniells Bridge Road from just north of the Chestnut Hill Road intersection to Jennings Mill Parkway, at Home Depot, across SR 10 Loop. The new roadway would be four lanes wide, but it would intersect with the existing Daniells Bridge Road, which is only two lanes wide at that point. Beshara and Provost said the project would include improvements to Daniells Bridge Road, though they are not included in the project description. 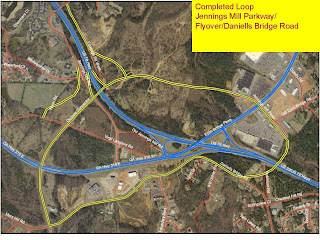 Beshara also said that he expected the project, if it involved improvements in Daniells Bridge Road from the extension back to the Oconee Connector, would cost about $30 million, rather than the $10 million price tag for the extension and flyover shown on the project list. Ralph Johnson, who lives near the Chestnut Hill Road intersection with Daniells Bridge Road, said that the description in the project list and the cost estimate should match with what is really needed. I also live just off Daniells Bridge Road, and I made a similar suggestion to the Committee. Provost and Beshara defended the existing description and cost estimate as being reflective of what the county has proposed in similar discussions in the past. Residents of Windy Creek expressed concerns over how the widening of Mars Hill Road will affect access to their subdivision. One woman, who said she cannot drive because of poor eyesight, asked what the county was doing to include people who do not drive in its transportation planning. None of the projects on the list dealt with public transit, and only a few of them included sidewalks and bike lanes. The final list that the county submits to the state will be reviewed by the Northeast Georgia Regional Commission and the Georgia Department of Transportation before going to what is called a regional roundtable. The roundtable will select projects from the 12-county region--Barrow, Clarke, Elbert, Greene, Jackson, Jasper, Madison, Morgan, Newton, Oconee, Oglethorpe and Walton–to be pitched to voters in the tax referendum. The majority of those voting from the 12-county region must approve the tax for it to be put into place in 2013. If passed, the tax would remain in place for 10 years and generate an estimated $1.5 billion for transportation projects for the region, according to Provost. The list of seven road projects that the Oconee County Land Use and Transportation Planning Committee will review on Tuesday night was produced by a small group of county officials to represent to the state the county’s transportation funding priorities through 2013. The county still must address any requests from its four cities and create a list to go to the Georgia Department of Transportation by the end of the month. Ultimately, the Oconee County list must be meshed with lists created by 11 other counties in Northeast Georgia to produce a unified list to go before voters in August of 2012. The expectation is that voters will be asked at that time to approve a sales tax increase of one cent on the dollar to fund transportation projects in the 12-county region. If voters in the region approve, the sales tax in Oconee County would increase to eight cents on the dollar. Wayne Provost, director of strategic and long-range planning for Oconee County, told me on Friday that he, Board of Commissioners Chairman Melvin Davis, County Administrative Officer Alan Theriault and Public Works Director Emil Beshara produced the list of projects that will be before the citizen committee on Tuesday night. He said the group met and exchanged information before agreeing on the seven projects. Provost presented the list to the BOC at its regular meeting on March 1, but the BOC took no action. The Land Use Committee meeting on Tuesday is the first chance that the public will have to react to the proposed road projects. Most of the projects on the list have been on other lists of road priorities for the county. The widening of Mars Hill Road and Experiment Station Road from SR 316 to Watkinsville is at the top of the list. The project has been broken into three phases, and these three are listed as the top three county priorities. The first phase–and top priority according to the list–is the widening of Mars Hill Road from SR 316 to Hog Mountain Road in Butler’s Crossing. The second phase is the widening of Experiment Station Road from Hog Mountain Road to the US 441 bypass around Watkinsville. The third phase is the widening of Experiment Station Road from the bypass to Main Street in downtown Watkinsville. The widening will be to four lanes and will include sidewalks and bike lanes. Total cost of the three phases is estimated at $66.6 million. The fifth project on the list is the widening of Jimmy Daniel Road from Mars Hill Road to the Clarke County line to four lanes, with sidewalks. The project is expected to cost $10.6 million. The construction of an extension of Daniells Bridge Road is the sixth project on the list, and it would include a flyover of SR 10 Loop to connect the existing Daniells Bridge Road with Jennings Mill Parkway where it dead ends at Home Depot. The extension, according to the project description, would begin just north of the Chestnut Hill Road intersection with Daniells Bridge Road and consist of four lanes and sidewalks. It also would include signals at the intersection of Daniells Bridge Road Extension with the existing Daniells Bridge Road and at the Daniells Bridge Road and Chestnut Hill Road intersection. The project, expected to cost $10 million, does not include any upgrades to the existing Daniells Bridge Road, which is two lanes wide at that point. The final project on the list is the realignment, widening and reconstructioin of US 441 to four lanes from the Watkinsville bypass to the Madison bypass. The cost of this project is estimated at $175 million. According to Provost, the county has final say on the list that must be submitted by March 30. Provost said he isn’t sure if the list will go back to the BOC for a vote at its March 29 agenda setting meeting or will be forwarded without further public review after the meeting on Tuesday night. The meeting of the Land Use and Transportation Planning Committee, made up of 14 citizens from the county appointed by the BOC, is scheduled for 7 p.m. at the Community Center in Veterans Park. The County actually submits the list on March 30 to the Northeast Georgia Regional Commission, which then passes it to GDOT. NEGRC represents the same 12 counties that make up the region for the transportation vote: Barrow, Clarke, Elbert, Greene, Jackson, Jasper, Madison, Morgan, Newton, Oconee, Oglethorpe and Walton. The Georgia Transportation Investment Act of 2010, passed by the General Assembly last year, creates regions around the state for the purposes of passing what is being called a Transportation Special Purpose Local Option Sales Tax. The regions have a great incentive to put the tax before the voters. If they do so, they not only get the designated projects funded, but the counties get additional revenues from the state for use for their own road projects. And if the regions do not put the tax before the voters, or if the voters turn down the tax, the state will decrease the amount of funding it currently provides to the affected counties for their road projects. The list that Oconee County will submit on March 30 is not constrained by the amount of money the tax will generate for the region. A group called a regional roundtable will review the lists submitted by the 12 counties and decide which ones are to be put before the voters and at what levels, given the revenues the tax will produce. The roundtable is made up of the chairman of the county commission in each of the counties and one mayor from each county. Oconee County is represented on the Northeast Georgia roundtable by Davis and by Watkinsville Mayor Joe Walter. The tax, if approved by voters in 2012, will run from 2013 to 2023. Provost told me on Friday that he, Davis, Theriault and Beshara were constrained in creation of the list by the criteria set out by the state. The project has to be “regional in character” and “deliverable in 10 years,” he said. Four of the seven projects on the list, the three phases of widening of Mars Hill Road and the Daniells Bridge Road Extension, are on the priority list of projects for the Madison Athens-Clarke Oconee Regional Transportation Study (MACORTS)for Oconee County 2010 through 2015. According to an outline of the seven projects on the priority list that Provost released to the BOC on March 1, the Mars Hill Road project is needed to accommodate additional traffic and provide a needed linkage between Watkinsville and SR 316. The widening of Jimmy Daniel Road also will improve the linkage between Watkinsville and SR 316 and West Athens, the document states. The Daniells Bridge Road Extension “will remove a significant volume of local traffic” from the SR316/SR Loop 10 interchange and Oconee Connector/SR 316 intersection by providing an alternative route from Watkinsville to Athens and Epps Bridge Parkway, according to the document. The widening of US 441 is needed to remove the last two-lane section of that roadway in North Georgia, Provost’s document stated. The Oconee County Board of Commissioners tonight voted unanimously not to take any action on the proposed Zoom Bait/St. Mary’s/Gordy sewer line project. The Commissioners did not rule out moving forward with the project at some point in the future, but it did not set any firm date to reconsider the sewer line. The decision would seem to preclude the county accepting the $186,711 grant the county has been awarded by the Georgia Department of Community Affairs for the sewer line. Work on the project would have to be completed by Oct. 5 of this year under that grant. The BOC took the action following a presentation by Jimmy Parker of Precision Planning Inc. of Lawrenceville and Oconee County Utility Department Director Chris Thomas, who recommended that the BOC move forward with a modified plan for a larger sewer line than originally proposed. Parker, a consultant to the county, and Thomas estimated the modified plan would cost between $790,000 and $820,000, or about 20 percent higher than originally expected. The modified plan increased the sewer line from 12 to 18 inches in diameter to allow for increased capacity of 3 million gallons per day, rather than 1 million gallons per day. The larger line would allow the county to connect to sewer lines along McNutt Creek the county might build in the future. The county began discussing the sewer line publicly in May of 2009. At that time, it was presented as a line to serve only Zoom Bait, a manufacturer of artificial fishing lures, and St. Mary’s Health Care System, both on Jennings Mill Road near the McNutt Creek border with Clarke County. In November Thomas told the BOC that he also had been discussing the project with Atlanta Developer Frank Bishop, who had an option on the 114-acre Gordy tract, which also would benefit from the sewer line. The Gordy property lies behind Lowe’s, WalMart and Kohl’s on Epps Bridge Parkway and will be open for development when the state completes the Oconee Connector Extension at the end of this year. The Commissioners tonight were being asked to rebid the sewer line project, since the initial bids had expired. Commissioner Chuck Horton made the motion not to take any action, and the motion was seconded by Commissioner Margaret Hale. Commissioner John Daniell said he did not want to see all discussions come to a halt, and Chairman Melvin Davis, who has been the proponent of the project, crafted a compromise motion that allows the county to revisit the project in the future. Commissioner Hale said the commissioners need to “put this to bed” and come back to it later without the pressures of the grant. The Commissioners tonight also heard a report from Wayne Provost, director of strategic and long-range planning for the county, on proposed priorities for transportation projects in the county. These are the projects that the county is hoping will be funded if voters in August of 2012 approve an additional 1 percent sales tax for transportation projects. Provost said the county is proposing that the widdening of Mars Hill Road from SR 316 to Watkinsville be the top priority, followed by a grade separated interchange for SR 316 and the Oconee Connector, a widening of Jimmy Daniel Road, a flyover of SR Loop 10 for Daniells Bridge Road, and a widening of US 441 to four-lane through the county, including a bypass of Bishop. Citizens will get a chance to review and discuss these priorities at the regular meeting of the Land Use and Transportation Planning Committee on March 8. That meeting begins at 7 p.m. at the Community Center in Veterans Park on Hog Mountain Road.